Celebrating my first year of Blogging! Been writing my blog for a year. So a year ago, I watched Love and Mercy (2014), a wonderful film biopic about romance and mental health. John Cusack’s moving performance as Brian Wilson inspired me to write and to start this blog, with my first post reviewing this film published on the 22nd October 2015. The film also inspired my rating system – of hulk moments, handsqueezer and weeper – as watching it without my husband, I sobbed and missed ranting at him about Paul Giamatti’s evil character and squeezing his hand to a pulp when I needed to (which I did, a lot). One year later, this blog has reached a staggering amount of countries and has had 15,611 views with 1,473 followers. I’m happy to report that my readers and views have increased every month, excepting August where I had a wee break in posting new posts. 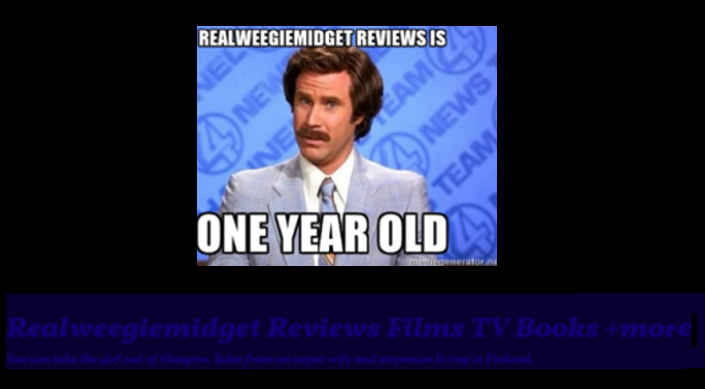 I’ve written 145 posts and pages reviewing TV, films and books. I’ve seen, read and rewatched some great ones, and some not so great. I’ve had so much lovely support from good friends and family over this time, as well as from other bloggers and celebrities. Celebrities have liked or retweeted my work after I shared it with them on Twitter and Facebook, and a few celebrities have even followed me on this sites (all of these leading to a few squeals of excitement). However you all have encouraged me just with a like, a retweet or share or a comment. A special thanks for my Darlin’ Husband for his supportive comments, love and for being a great editor. Also for providing a great hand to squeeze. During this time, I’ve joined 21 blogathons and run my first one on the Darlin’ Dallasers Blogathon. Joining a blogathon is fun and scary the first time as there are so many amazing experienced bloggers out there, as a newbie it’s daunting sending in your work. However, I’ve received some lovely feedback from these bloggers in relation to these posts, it’s meant so much. My Darlin’ Dallasers blogathon was in honour of the wonderful Larry Hagman, who would have been 85 this year. I had an amazing response from my fellow bloggers who joined in sending me reviews with Dallas cast members from Linda Gray to Lesley Ann Down and Larry Hagman to Ian McShane. And I was happy to see and share with these bloggers when they received supportive feedback from their Dallas cast members for their contributions to this blogathon. I’ve met some lovely people through writing this blog and received 4 Liebster Awards from bloggers which was quite a compliment. But difficult, in that I had to choose a further 11 blogs to get this honour and there being so many great blogs out there. So with a little help from Mr Di Caprio above, this post is just as wee thanks to all of you for joining me on this journey, it’s been amazing and thanks for all your great support at this time. I’m looking forward to my next year in blogging, which I hope you will join me for..
Here’s to many more years of blogging enjoyment! Thanks x Loving every moment so far, so why not! Your blog has been fantastic with loads of great posts! Congrats on your anniversary. Here’s to another great blogging year ahead! (and many more). Hip Hip Hooray!